NEW DELHI (Reuters) - Delhi Chief Minister Arvind Kejriwal said his office was raided by federal investigators on Tuesday on the orders of Narendra Modi, in the latest clash between the feisty local politician and India's prime minister. The Central Bureau of Investigations (CBI) was not raiding Kejriwal's office, said a senior CBI official, who declined to be identified as he was not authorized to speak to the media. CBI investigators were searching the office of Rajendra Kumar, principal secretary of the Delhi government, near Kejriwal's office, the CBI official said. Kumar is under investigation for corruption. 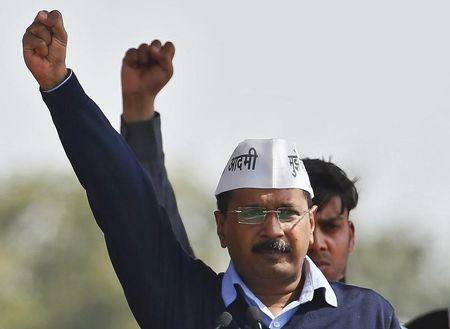 "Modi is a coward and a psychopath," Kejriwal said on his Twitter page. "When Modi couldn't handle me politically, he resorts to this cowardice." The federal government rejected Kejriwal's allegations, and said it had no role to play in the police investigation. Kejriwal and Modi's central government have been involved in a power struggle over the appointment of bureaucrats and the control of police since Kejriwal's party came to power in the capital earlier this year. That election victory in New Delhi smashed the aura of invincibility built around Modi in his first major electoral upset since being appointed prime minister. Kejriwal says Modi has been attempting to sabotage his government to stem his popularity and destroy his chances of breaking the dominance of India's two national parties. Parliamentary Affairs Minister Venkaiah Naidu told reporters the CBI is an independent organization and does not act under the orders of the government. "It has become a fashion of the Delhi chief minister to quarrel with the central government and take the name of the prime minister for each and everything," Naidu said.